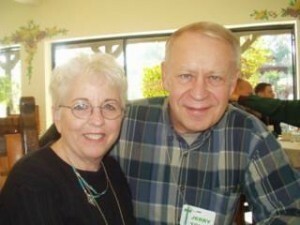 Jerry Young, longtime retired Grace Brethren pastor of the Lititz, Penna., Grace Brethren church and most recently director for the Association of Grace Brethren Ministers, went to be with the Lord at about 1 a.m. today, Wednesday, December 8. The last several years he had been battling with cancer. Reproduced here is the Caring Bridge site information from Jerry’s wife, Loreen. A full obituary will be posted when it is available. Well a very early good morning to you. It is 4:30 a.m. Here is the story. Last Tuesday I finally knew I was not able to handle Jerry staying at the house any longer, it was getting too difficult as he continued to decline. I felt the loving thing to do was to place him in Hospice last Tuesday night and and he had great care there. As he continued to decline over the past week I knew that I had made the right decision. As of today he had not eaten in 14 days nor had anything to drink for 7 days and was really suffering. One morning he said, “I have been praying and praying and I just want to go home. Why is it taking so long?” So after one week at hospice he became unconscious yesterday and today, and then he was finally released into the hands of Jesus early this morning at 1 a.m.
Janae and Allison have been here with me for the past week so I called Allison to come in to pick me up after we both spent some time with Jerry saying our good byes. He has suffered so much this past year and he wanted to be with home with Jesus and it was breaking my heart to see him like this, so I was also ready for him to be with Jesus, but that sure did not make it any easier for me. Right now we are planning to see visitors at Lititz Grace Brethren Church next Saturday Dec. 18 as a drop-in, but no open casket. Then the memorial service will be on Sunday afternoon the 19th but do not have the times yet for those. The graveside service will be at the Indiantown Gap Military Cemetery on Monday the 20th for just the family. I look forward to seeing many of you dear friends in PA and just say thank you so much to all of you for praying for us for this past year. And so many of your responses usually bring tears as you recall memories of my wonderful husband of so many years. What a huge blessing he has been to SO many people. And now I am thankful he was raised up on wings of eagles and is in Jesus loving arms. Thank you God. Love you all so much. Blessings to all of you. Thanks for letting us know about Jerry's passing. It helps me to know how we can pray for Loreen, Janae, and Allison. I will miss this very good man and wonderful leader. Good my, for now. All of our prayers and thankfulness for Loreen and family at this time, from Still Waters GBC in Pottstown, PA. You all mean so much to our fellowship! Jerry was an inspiration to me as a church planter. He was a strong leader. His dear wife is a trooper and my wife loves you! It was a pleasure to be the OB leader of one of your kids! May he grow up to be like his father....a man who followed hard after God! We love you all and are praying with and for you! Jerry & you, Loreen, were mentors from a distance to Margie and me...from the days when we were in Palmyra, PA all the way through the Philadelphia, PA years and now in Frederick, MD. Margie remembers with joy Pastors' Wives Retreats with you at Camp Conquest! I remember with respect Jerry's wisdom at Pastors' Meetings in the District and at National Conference. We are praying for you and the kids and grandkids. We love you!